Our K9 selection process is based on each canine breeds’ natural characteristics and successful history as detection and/or working dogs. AMK9 selects dogs with the highest level of environmental tolerance along with a high level of hunt and play characteristics. Dogs with these types of characteristics are a pleasure to train because they are undistracted in a robust environment with exceptional endurance, enthusiasm, and motivation for performance activities. 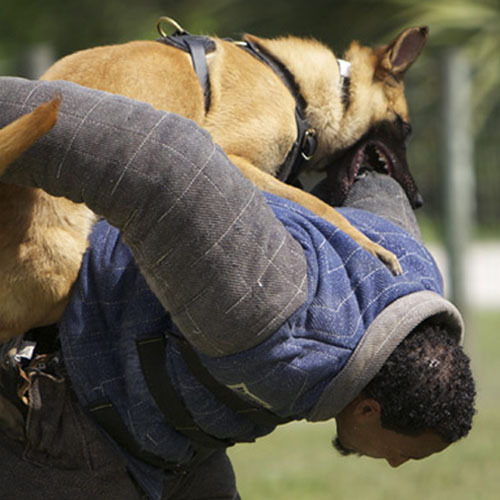 AMK9 bases the breed(s) selection on what breed is best for the job. Consistent and appropriate behavior through all circumstances, including loud noises. Typically, less than ten percent of the canines screened will pass the initial evaluation and be approved for training at one of AMK9’s facilities. Once the dogs are at AMK9, our team of K9 trainers carefully evaluate each young dog, assessing it for stamina, drive and level of aggression. This step is especially important. For example, while one dog may be better suited for canine detection, another would make a quality personal-protection dog. AMK9 uses the highest standards within the industry to evaluate our canines and ensure we are meeting contractual requirements and customer expectations. Our standards meet and/or exceed the most commonly used standards within the industry. Known for its direct, fearless disposition, the spirited German Shepherd Dog is a top pick in law enforcement agencies. But the Shepherd is an ‘all rounder’—its temperament coupled with a strong, muscular body makes it a distinct favorite as a military working dog and general security dog too. The German Shepherd is: alert, cheerful, confident, courageous, intelligent, keen, obedient, serious, tranquil, extremely faithful and eager to learn. They will not think twice about giving their lives for their human pack. One of the four types of Belgian sheepherding dogs, the Belgian Malinois is a high-energy breed, well-known to both law enforcement and the military, and a prized K9 partner. Although sometimes mistaken for the German Shepherd Dog, the Malinois is more elegant in build and lighter-boned, but does not lack for strength, agility or herding ability. A very bright and obedient dog, it is determined and observant with strong protective and territorial instincts. The Belgian Malinois retains a strong work ethic and is happiest with regular activity and consistent, focused routine. The Belgian Malinois is: alert, agile, intelligent, obedient, strong, territorial, highly trainable and naturally protective. They are not overly aggressive, making the breed excellent for security purposes. The Dutch Shepherds are among the most competent of all shepherd dogs at such tasks as agility, catch, obedience competitions, guard work, herding, field trailing and leadership. Attached to its territory and an enthusiastic worker, this dog is cunningly smart. They are very authoritative and seen as natural pack leaders. The Dutch Shepherd is: agile, enthusiastic, intelligent, obedient, sober and very loyal to its handler. Unwanted visitors will be stopped in their tracks when approached by this breed. The Labrador Retriever is loving and patient, making it a great family dog. Being highly intelligent and gentle in nature the Labrador Retriever is a popular and logical choice for service dog work. This versatile hunting breed comes in three colors: yellow, black and chocolate. Because of the dog’s aptitude to please its handler the Labrador Retriever excels as part of a search-and-rescue team, or in drug detection with law enforcement. The Labrador Retriever is: affectionate, good natured, intelligent, loyal, patient, willing and eager to please. This is one of the most popular breeds in the world. The Springer Spaniel has been endowed with style, enthusiasm, and an eager-to-please quality common to most spaniels. He is recognized for his ability to keep going and going under adverse hunting conditions, which is partly due to his medium-sized, powerful body. He has long, hanging ears and a moderately long coat that can be black or liver with white, blue or liver roan, and tricolor. The Springer Spaniel is: brave, energetic, even-tempered, friendly, gentle, intelligent, obedient, playful, pleasant, skillful, sociable, willing and a quick learner. Their tails are seemingly always in motion as they earnestly get on with the job at hand!